I draw on nearly 20 years of international teaching experience to offer writing workshops to writers at every stage of their craft, with tools, insights, expansive exercises, and supportive interactions. 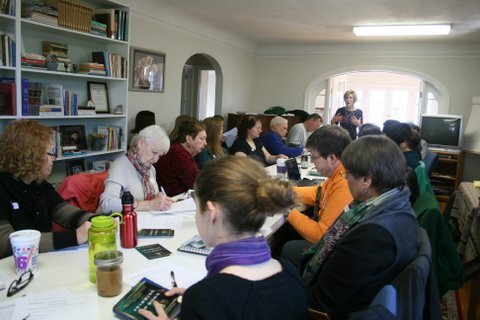 I love doing workshops and work hard to have participants leave inspired and energized for their writing journeys. Typical workshops are short, a couple hours: long enough to generate great ideas and new directions, but short enough to fit busy schedules. Exercises, handouts, discussion and small group work, are designed to serve writers (and aspiring writers) of multiple genres: fiction, non-fiction, memoir, poetry, and personal communications of all kinds. I’ve designed workshops for writer guilds, church groups, K-12 classes, Road Scholar (Elderhostel), and ESL/EFL groups and the general writing public. With a long client list for professional writing of speeches, websites, training programs, documentaries, articles, brochures, and proposals, I have also designed and delivered professional writing seminars & workshops to corporate & non-profit groups. To find out more, please contact me at p.schoene@comcast.net.